Today is Sunday Stealing! Actually, it's tomorrow. But I'm gonna go ahead & do mine! Today, Brad & I went to La Madeleine's for lunch & then Barnes & Noble. We hung around in there for awhile & then ran by a few shops to get some Christmas gifts. Thankfully we knew exactly what we had to get! After that it was Wal-Mart for groceries & 2 of the gifts we needed; one of which they were out of! Grr. Oh-well, we'll grab it later! I could not find the grocery list ANYWHERE (& it's not at home either. No clue where it went!) so i guessed on the groceries - & forgot 4 items. Blah. Anyhoo. Time for Sunday Stealing. After you read mine, do your own & then go on to Sunday Stealing to add your link! I love the Grinch - the Jim Carrey one! 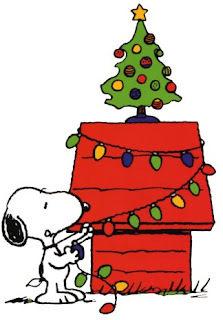 & i love Charlie Brown's Christmas. 2. What holiday character do you think you're most like? Erm? I have no idea. 3. What holiday character does your spouse think you're most like? 5. Most hated Christmas/holiday song? Can't think of any right now... certain arrangements of certain songs. 6. If you have an all holiday music radio station when do you start listening to it? 96.1 - whenever they start playing "all christmas music". This year it was a bit early for me, but i always keep it on their station! 7. If you have an all holiday music radio station do you love it or hate it? It's the station i listen to already - but at some point they start playing only Christmas music. I love it. 8. Have you ever wrapped yourself as a Christmas present? 9. Who is Rudolf The Red Nosed Reindeer's father? 10. Do you drive your neighborhood or one near you at night to look at other people's holiday decorations? 11. When you see a heavily decorated house do you think, 'oh that's lovely'? Or do you think, 'oh criminy, that looks like Christmas threw up all over their lawn'? I think "oh wow. that's tacky." HAHA. 12. Are you counting the days to Christmas with excited anticipation or dread? I'm so excited! Mainly about getting together with all the family on days when we'd all normally be at work! 13. When was the last time you had your photo taken with Santa? Did you sit on his lap? I do not remember. It's been YEARS. Decades! Yes, i sat on his lap. 14. Do you make a Christmas list for your spouse or significant other or do you rely on them to pick your gift(s) without a clue from you? 15. When do you put up your tree? I think i'm going to be okay with FAKE. 17. When do you take your tree down? 18. Do you shop the day after Christmas sales? What do you shop for? the DAY after??? No. Though i want to get a regular sized tree next year, so i might shop for ornaments & such for next year. Since they'll be on sale. 19. Is your work/office having a holiday party this year? Will you attend? We called it a Christmas Party & we had it last Wednesday. We went to Don's Seafood. YUM! 20. Do you have your New Year's Eve Plans set yet? I LOVE hanging out at Barnes & Noble!! :) We don't have any New Year's Eve plans yet either...we are usually pretty low key. :) I love The Grinch too, Jim Carrey is hilarious! !